SOAC cars at their final resting place, the Seashore Trolley Museum. Photo by David Pirmann, June 2011. Thanks to Jeffery Mora (Transportation Systems Manager, US Federal Transit Administration) and Bill Mosteller for the information below. The following is an excerpt from a report published by the Federal Transit Administration. The text below is in the public domain. From: Urban Rapid Rail Vehicle And Systems Program, Boeing Vertol Company, Surface Transportation Systems, December, 1979. Final Report, prepared for the Urban Mass Transportation Administration, Office of Research and Development, Washington, D.C. 20590. Report No. UMTA-IT-06-0026-79-6. Procurement of the SOAC was initiated in June 1971 with a survey to determine industry interest that culminated in July 1971 in requests for proposals to five companies: The Budd Company, Pullman Standard, Rohr Industries, St. Louis Car, and Vought Aeronautics. 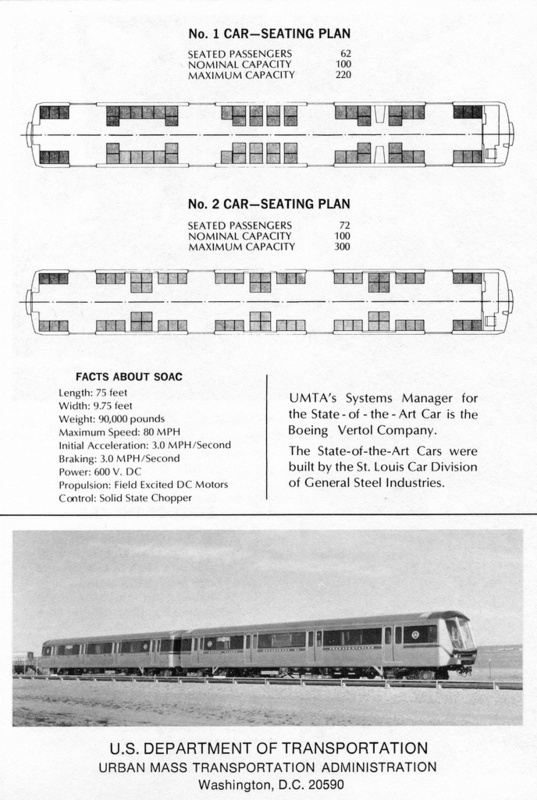 Evaluation of the three proposals received from Pullman, Rohr, and St. Louis Car resulted in Boeing's recommending and UMTA's approving award of the subcontract in September 1971 to St. Louis Car Division of General Steel Industries for two cars. Length over couplers: 74' 8.5"
Truck wheel base: 7' 6"
Width over thresholds: 9' 7.25"
Height of roof from top of rail: 11' 8.5" to 12' 1.5"
Height of floor from top of rail: Adjustable, 41.5" to 46.5"
Following a preliminary test and adjustment phase, the SOAC vehicles underwent extensive testing at TTC. In addition to confirming vehicle performance characteristics, the SOAC tests established an engineering data baseline for future programs and for comparing various transit property track characteristics to the Rail Transit Test Track. A delay in testing and evaluation was caused by a collision in August 1973, necessitating major repairs to one of the two cars. After these repairs were completed in December 1973, systems testing was partially repeated and completed in April 1974. Testing included 10,219 miles of simulated demonstration operation: 4,197 car miles before and 6,022 car miles after the accident. The operational demonstration and evaluation phase of the SOAC program started when the cars arrived in New York City on April 18, 1974, and ended with the completion of the Philadelphia demonstration on April 30, 1975. Pertinent statistics from the 5-city operation are given in Table I. An extension of the SOAC demonstration program to provide approximately 9 months of revenue service on the Port Authority Transit Corporation (PATCO) High-Speed Line between Lindenwold, New Jersey, and Philadelphia, Pennsylvania, was arranged at PATCO's suggestion. Initiation of the service was delayed until August 12, 1976, due to necessary vehicle modifications and a protracted negotiation for liability insurance coverage. Several problems resulted in only 23 days of intermittent service and subsequent termination on January 24, 1977. The vehicles were then stored at Boeing Vertol awaiting induction into the Advanced Subsystem Development Program. In May 1979, one was shipped to The Budd Company and the second to TTC, where both will be involved in a separate contract test program of ASDP trucks and brakes. A full-scale mockup of the SOAC was designed and built to provide a means of demonstrating the SOAC exterior and interior design to a larger segment of the public than would see the cars during the operational demonstration. The mockup, highway transportable in two sections, was first displayed publicly at the U.S. International Transportation Exposition (TRANSPO 72) from May 26 through June 4, 1972. Through April 1975 the mockup was displayed in eight additional cities, including nine points in four of the SOAC operational demonstration cities, and was visited by more than 680,000 people. Following its use for mocking up ASDP cab modifications, arrangements were concluded in late 1979 to turn over the SOAC mockup to the Department of Economic Development of the State of Delaware. SOAC successfully demonstrated modern transit car technology to transit authorities and the riding public in five major cities. Incorporating features and improvements based in part on operational evaluation of BART vehicles, the SOACs were well-received. The riding public was impressed with the smooth ride, low noise, air conditioning, interior appointments, and high light level, while the motormen assigned to SOAC found the smooth response, fine control, and automatic speed-maintaining system particularly desirable. The SOAC program developed data to better define the rail rapid transit environment. Differences between the trackage at the properties and the TTC were pointed up by the engineering test data and by the differing maintenance requirements encountered. The DC-to-DC chopper technology demonstrated on SOAC and used on BART influenced the decision to use this technology on Light Rail Vehicles (e.g., Boston, San Francisco, Cleveland, and Philadelphia) and heavy rapid rail vehicles (Atlanta, Baltimore, and Miami). Motor-alternator with AC auxiliaries for reduced maintenance (CTA and SEPTA). Forced-air traction motor ventilation (CTA, MARTA, SEPTA, and MBTA). Self-cleaning inertial filters (MBTA and MUNI). Acoustical design to reduce wayside and interior noise by 10 to 15 dBA (all new rail vehicles). Improved-ride quality air-suspension truck (MARTA, MBTA, MUNI, and WMATA).